Oi! You! Are You a Writer? Whoa, whoa, whoa, Emily. Another post? What? This is your fifth in four days! Yeah, I know. Maybe it’s all the coffee I’ve been drinking lately. Just be glad I haven’t been drinking Mountain Dew. Oh Lord, you should be very glad indeed. What up, readers and fellow writers? So there’s this writer/blogger I discovered recently, and he’s doing something super cool that I thought some of you might enjoy hearing about. For the next fifteen days, Jeff Goins will be challenging his readers with different habits that help a writer’s craft. But Emily, don’t writers just sit down at their computers and type out literary gold? Yes. We also sneeze glitter and poop rainbows. Double rainbows. Seriously, though, when I was younger, I did think that great writers just wrote one draft and never had writer’s block and everything was sunshine and gumdrops. Now I realize that’s such bull. Anyway, so this Jeff dude will be going over a different habit for his readers each day, and then he will be setting a challenge for them each day. His series is based off his book, and yes, it’s a bit of a ploy to get you to buy it, but hey, it can’t hurt, can it? Plus, there are going to be prizes. PRIZES. C’mon, everybody loves a competition. And the whole thing is free, too. Anybody feel like joining me? Sounds pretty fun. 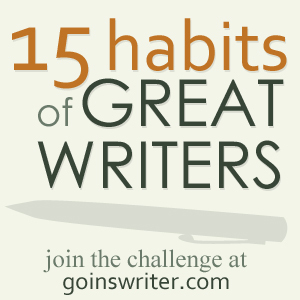 This entry was posted in Inspiration, Writing and tagged 15 Habits of Great Writers. Bookmark the permalink.